Professional farriers from across North America and beyond will park their shoeing rigs from February 25-28, as they gather in Chattanooga, TN for the American Farriers Association’s 38th Annual Convention. Drawing more than 1,500 participants—primarily farriers from the AFA’s 50 chapters—this annual event focuses on continuing education and features lectures, demonstrations, clinics, discussions, awards, contests, and more. Farriers and equine veterinarians will have ample opportunities to further their knowledge of anatomy, to re-examine basics, to learn new techniques, and to examine both theory and practice. 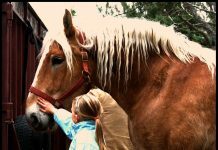 The educational opportunities are not limited to farriers and veterinarians, however. This year, the AFA also presents Horseman’s Day 2009 on Saturday, February 28. This eventful day features a presentation by America’s Most Trusted Horseman, John Lyons. In addition to Mr. Lyons’ presentation on training your horse to stand for the farrier, AFA farriers will be speaking and demonstrating on a number of topics aimed at the horse-owning public. Owners, enthusiasts, and equine professionals are invited to attend this day, which is offered at a special rate of $10 per person. Convention and Horseman’s Day attendees will also be able to enjoy a trade show featuring more than 100 exhibitors, offering equipment, supplies and services for the farrier. With five days of non-stop educational activities, more than 50 lecturers and clinicians—from the United States, England, and Japan—will be hard at work. Farrier certification, one of the cornerstones of the AFA, will be at the forefront of the convention. Many attending farriers will work in the anatomy labs and the hands-on clinics to fine-tune their knowledge and skills in preparation for certification; others will take the written portion of the certification exam. Contestants in the farrier competitions will vie for a coveted position on the American Farriers Team, attempting to secure a spot as one of four farriers who will spend the next year serving as ambassadors from the AFA to the world. 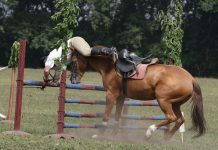 Team members represent the AFA at competitions in England, Canada, and other countries; additionally, they conduct clinics for AFA Chapters and for the horse-owning public. Many members will also have completed application for the AFA’s Cultural Exchange Program and will interview for several opportunities available through this program. Members qualifying for this opportunity travel abroad on exchanges ranging from one week to three months, returning to share their experiences at the Annual Convention and other AFA events. The American Farrier’s Association is a non-profit organization with a mission to further the professional development of farriers, to provide leadership and resources for the benefit of the farrier industry, and to improve the welfare of the horse through continuing farrier education. 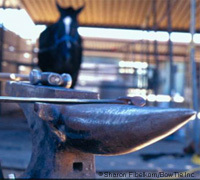 For more information about the American Farrier’s Association visit www.americanfarriers.org. Learn more about hoof care. My barns ferrier went to something like this a while back, he said it was great!